Lurraldebus extends its pioneering mobile ticketing service LurTicket to the long distance lines San Sebastián-Bilbao, San Sebastián Vitoria-Gasteiz and the line connecting Bilbao airport with Eibar, Bergara, Arrasate and Oñati, as a fast and direct alternative to automatic ticket machines and window tellers. Following the success of the Lurraldebus’s mobile ticketing App LurTicket for ticket retailing on the line connecting San Sebastián with Bilbao airport, live since July with nearly 3.000 tickets sold, the Foral Mobility Department led by Marisol Garmendia has decided to extend this pioneering system to other lines so that more Lurraldebus users can benefit of the convenience of purchasing their tickets from the App. Starting today, Lurraldebus has extended the ‘LurTicket’ App to the long distance lines San Sebastián-Bilbao and San Sebastián Vitoria-Gasteiz, and the line connecting Bilbao airport with Eibar, Bergara, Arrasate and Oñati. In these lines, 30% of the users are not the MUGI system to travel, meaning that 335,000 people every year can now purchase tickets anytime, anywhere on their phones with LurTicket. With regards to the service Arrasate-Bilbao airport, over 26,000 used this line in 2017. The LurTicket system allows passengers to download an app onto their smartphones which can be used to purchase tickets and display them on screen as a dynamic and encrypted barcode which is scanned by the driver when boarding the bus. Tickets, that are paid using a bank card, can be purchased up to one month in advance, and have to be activated before boarding the bus. 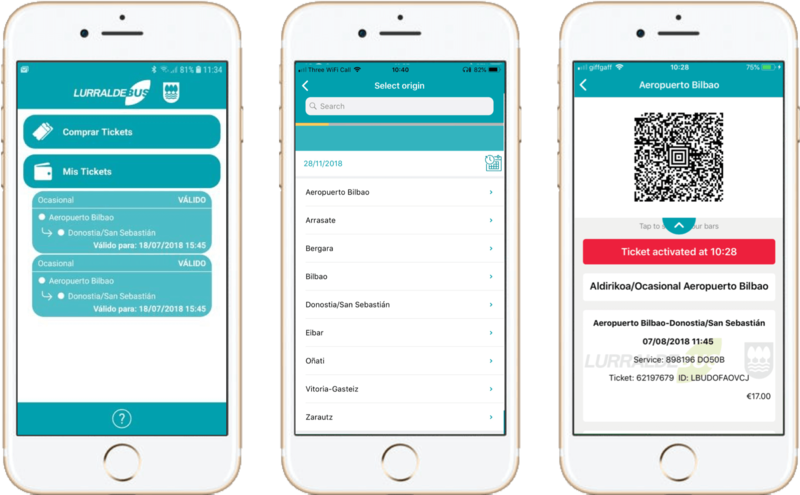 ‘LurTicket’ is now launched on lines between San Sebastián and Bilbao and between San Sebastián and Vitoria-Gasteiz, both for day and night services, that during 2017 were used by more than 1.1 million people. Furthermore, this completes the deployment started last summer of LurTicket in the Bilbao airport line and San Sebastian with the line between Bilbao airport, Eibar, Bergara and Arrasate. The use of the mobile ticketing app is seeing continuous growth, going from 2.4% of all the tickets sold in July up to 5% currently, with 3,000 tickets purchased with LurTicket. This mobile ticketing App substantially improves the user experience on these lines, especially in the Bilbao airport and long distance lines connecting the capital cities, and adding maximum ease and convenience to passengers as they no longer need to use the ticket vending machines or purchase their tickets onboard, removing the hassle of, for example, having to carry cash. On the other hand, the fact that LurTicket is available in Spanish, Euskera, and English, makes the purchase of a ticket in something simple and accessible for both local and the numerous visitors and tourists that use these bus services. The app has been developed by the Basque company Gertek using the Justride SDK from Masabi, the market leading ticketing technology, that offers multi-language support, with Euskera, Spanish and English and is already in use with over 40 transport operators across 4 continents around the globe, including in major cities such as New York, London, Las Vegas, Los Angeles, Boston, Sydney and in countries such as France and the Netherlands. Gertek is an integrating company in solutions that allow progress in the digital transformation of mobility. Based on the experience gained in the management of urban mobility services, tools and products have been integrated to improve the mobility of people and materials. Masabi is the global leader in mobile ticketing and innovative fare collection across all types of public transport including buses, trains, trams, ferries and subway. Its technology signals the end of ticket queues, lost tickets and fumbling for cash by allowing passengers to quickly and securely buy and display tickets on their mobile phones.